Recently a friend was on the search for a new washer and dryer set and I was raving about ours. I figured it was time I shared my thoughts here on the set we purchased years ago. In short -- I LOVE them. But there are a few things to think about that I'll go over. I know there's big debate over top/front loaders. (Seriously, people get a little weird about their dedication towards one or the other, right?) We went with top loaders mostly because I didn't want to deal with the mildew issues so many have with the front loaders. It sounds like it's gotten better over the years but I just didn't want to have to mess with cleaning the door. Look how it still looks brand new too! Love it. Back in the day I'd fill our old washer with clothes and if it was too full it wouldn't get everything clean. We've never had a problem with that yet. I don't miss the agitator at all either. I've never had a problem with clothes getting torn up and they are always clean. Two things I love about the washer -- it senses how much is in the washer so it only fills with as much water as is needed. No need to set it for a certain level. Also, the spin cycle is the BOMB. Seriously, even heavy blankets come out nearly dry because the spin works so great. The only thing I would caution about this washer is it may not be ideal for shorter folks. The basin really is super deep and even at 5'9" I have to really lean in there to get all the little socks and stuff. If you are a few inches shorter you may need to use a stool and it won't be as comfortable to use. I love that I can set it quickly with one of the settings on the dial or make my own with time/heat/steam. Again, the capacity is HUGE and I can put a ginormous load in there and it will actually dry. Imagine that. I remember running our old dryer for an hour finding half of it still wet. I really think the spin cycle on the washer helps this tremendously. One of my favorite parts of the dryer is that it somehow senses how wet the clothes are. I guess that can be a drawback too, because if you turn it on a setting on the knob and the time shows 35 minutes, it may take longer than that depending on the load. I've set a timer and gone back down to find it reset for more time because the clothes weren't dry. It's not a negative thing for us -- I like that it takes care of that on it's own! 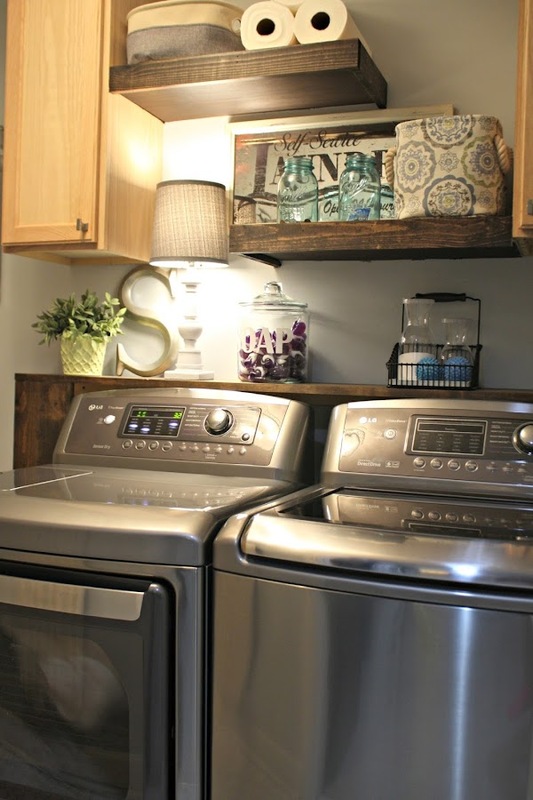 I'll add links to a few of the projects in this space below, but if you have any other questions about the laundry room or the washer and dryer, please ask away! Thanks for this post. I need to buy a new washer & dryer set in the next year or so and was leaning towards a top loader just for the fact that they hold more. I have a 15 year old top loader set and it has held up great. I will be looking at LG more closely b/c of your good experience. Thank you for always giving your readers great posts! Just bought an LG and love it! I'm a front loader. And I had a front loader set before this one for 6 years and it was the old kind and NEVER ONCE did it get mold smelling. I just didn't latch the door when it was wet. Now they have gotten even smarter and the front loaders (at least my LG) has a magnetic piece that holds the door closed without latching so that it can air out. I've NEVER had mildew smell even with 4 kids and a brother who didn't always keep the door unlatched after a wash. The front loaders seem very similar as the top loader details you talk of...and I love it! Senses the load, spins out the water, huge capacity and very easy to get clothes in and out of. We bought a front loader a year and a half ago and I can't stand it! I feel like I have to contort my body to load and unload it. Our house is for sale and I'm hoping future buyers want to negotiate for our washer and dryer so I can get a new top loader for a new house! we just bought the LG front loader a couple months ago (after a month of dealing with the installation - we live in a condo). but i was glad we went with LG because seriously my clothes are CLEAN! and it also doesn't latch so it lets it air dry. After your column on reversing the dryer door, I did that to my own dryer. Well, it's not my OWN -- it came with the apartment, and it's in a teeny, tiny room where the door swing didn't make sense at all. I'd have to stand outside of the room and lean over the door to put clothes in the opening. But after seeing your column, I got out my handy-dandy screwdriver and within 15 minutes, my whole laundry life was changed! Many thanks -- not only from me, but from future tenants of this apartment!! My daughter in law is an exec at LG...will pass this on to her! I have that washer and love it! I bought it because I have two boys and it was the washer that had the highest capacity within our budget :) I love the little song that plays when it is done, too! I definitely plan on getting an LG dryer when ours finally kicks the bucket! On size - I am 5'2" and I have salad tongs in my laundry room to able to get that last item. But, if I can't get it, it stays in there for the next round. I don't need broken ribs reaching in there! On water levels - I miss being able to fill up the washer and let clothes soak overnight. So, I have a small tub that I can soak clothes - stuff needing a bit of bleaching or soften the ground-in red Okie dirt. But I will also use the bulky load option to get more water in the tub. You have to check out all of the options in order to fool the smart machine! On the good side - I do like the machine figuring out the amount of water for most loads, so I don't mind doing small daily loads. No problems with the dryer, though you do need to check out the options to be able to get things out in time. I opt for a shorter/temp option, pull out items as they are done and then continue on. The refresh option is nice. The option I got has the controls in the front, which is nice for access, but you have to be careful about putting stuff on top - it can fall off the back of the washer & dryer (no backstop). My name is Jody (from Mi). 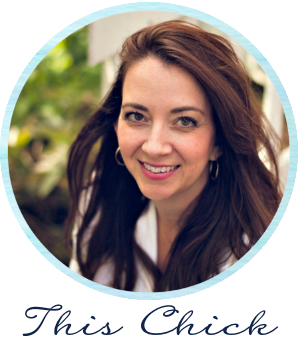 I've been reading your blog for years and I've gotten tons of great ideas - thank -you. I always think you're so lucky to do this for a living. I am a blogger want-a-be, but in real life I'm an RN and lets face it - you can't blog about your patients. Although, the stories I could tell....lol. Anyway, we have the same problem in our laundry room/mudroom/disaster room that you originally had - just crap everywhere. I have tried for YEARS to figure out a better system and there just wasn't one - until I saw this post and started clicking back to the beginning of the basement move. Brilliant! I really do think that would be our only option, but there are tons of things to think about. Our basement is already completely finished - every corner, so I don't know where a laundry room would actually go. I do have a question in all of this for you. 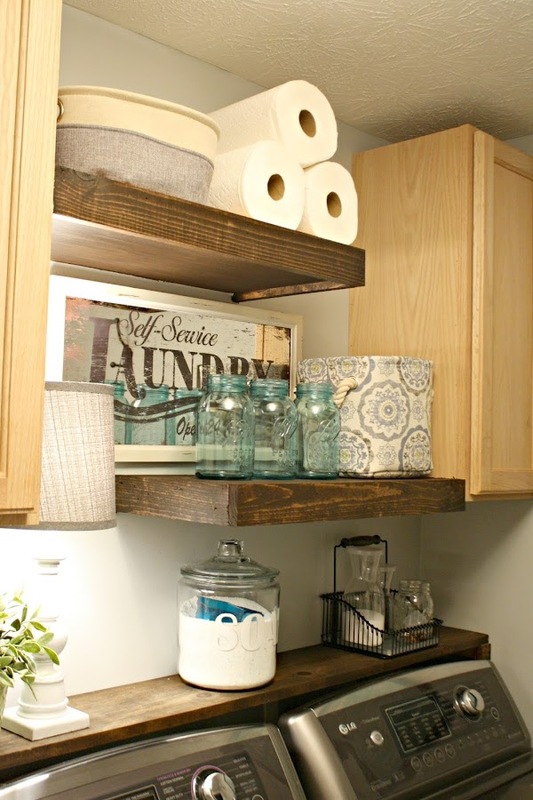 Two really - first, my laundry room/mud room/land fill room is like a giant magnet for dust - do you have a dust problem in yours? If I had all the decor in mine that you have in yours (which I would love) it would be covered by the end of the week and that's just not another room I want to add on to my housekeeping list. 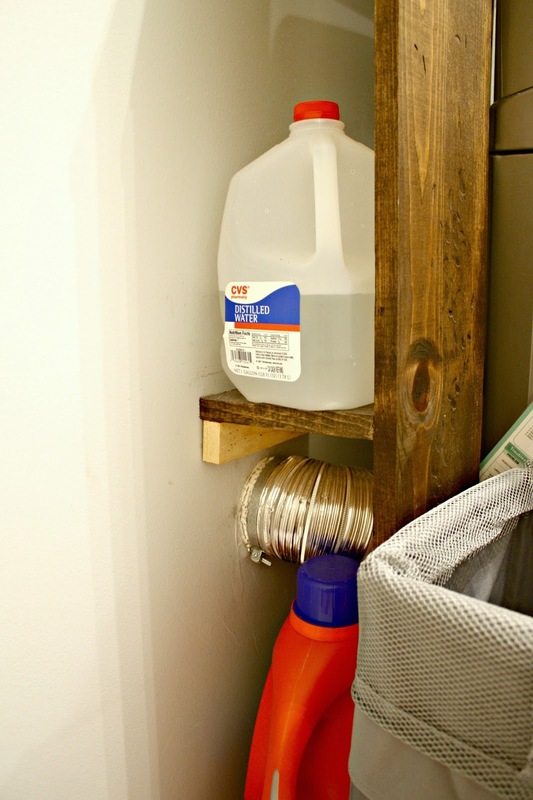 Second - where is your utility tub for your laundry room? I thought everyone needed one for the washing machine to drain into. I'm no plumber by any means so I could totally sound like a dork right now. 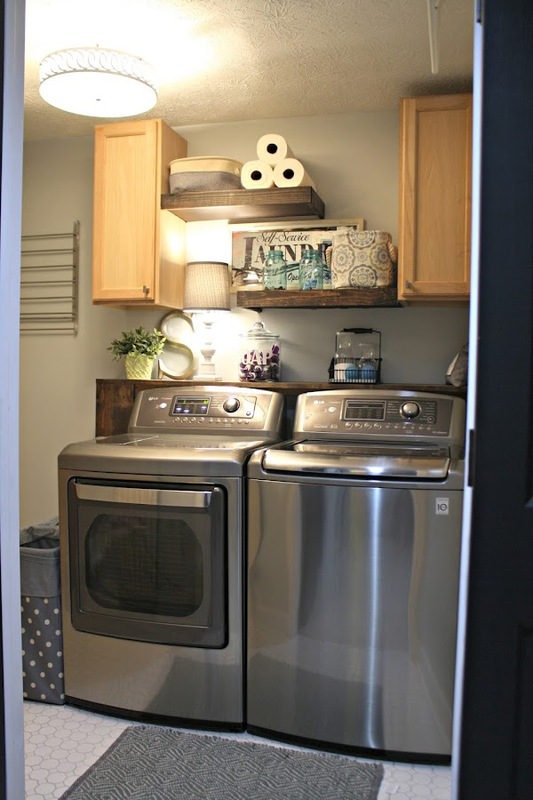 I've just never seen a laundry room without one. We still have an older dryer but I think we have a similar top loader but we have a Samsung. I also did not want a front loader for the mold issue. I honestly got the Samsung because we have had an awful time with our LG fridge and have not had a great customer service experience. We have a stool near it because my 8 year old does her own laundry. She has never fallen in! But the new technology makes it easy for her to do her laundry. I hate our old dryer and keep wishing it breaks down! I have a top loading washer and I hate, hate, hate it. There's the mildew problem. Then there's the fact that my machine doesn't have a true soak cycle. I also find I need to rewash soiled items. The grossest thing is when socks get caught in the nasty gasket. Never again. 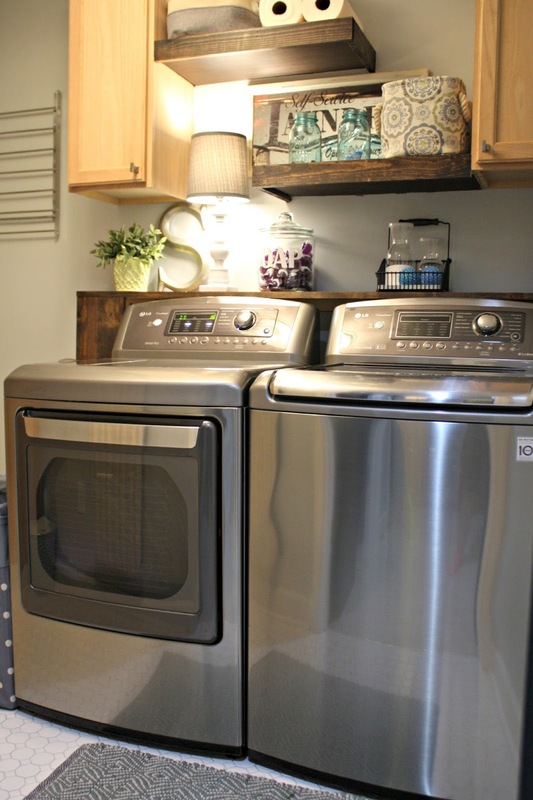 I'm going to need a new washer and dryer in the next year, so was glad to read about your experience with the LG top loader over time. A friend has an HE machine (not sure which kind) but said that you have to put Color Catcher sheets in a mesh bag or they will get sucked into the machine and cause a problem. Anyone have that experience with dryer sheets or Color Catcher sheets in their HE machines? Hi Sarah-I have the LG front loader and I love it! You're right about being a top loader or front loader person! But seriously I love my LG washer and dryer! Most of our kids are older and have moved out but this washer and dryer held up to 6 kids at one time!!! I don't have any mold issues with the washer as long as I don't latch the door closed after using it. Plus. I bleach all my whites so that helps. I love your blog! Thanks for all the great ideas over the years! Great to read reviews about appliances. We have a Samsung front loader. I hate the thing. I do not have a problem with mildew, that is not the issue. The problem I have is we can not, after much effort, get the stupid thing level. I live in a 100 year old home and the floors are uneven, not that uneven, but I know they are not like a new home. 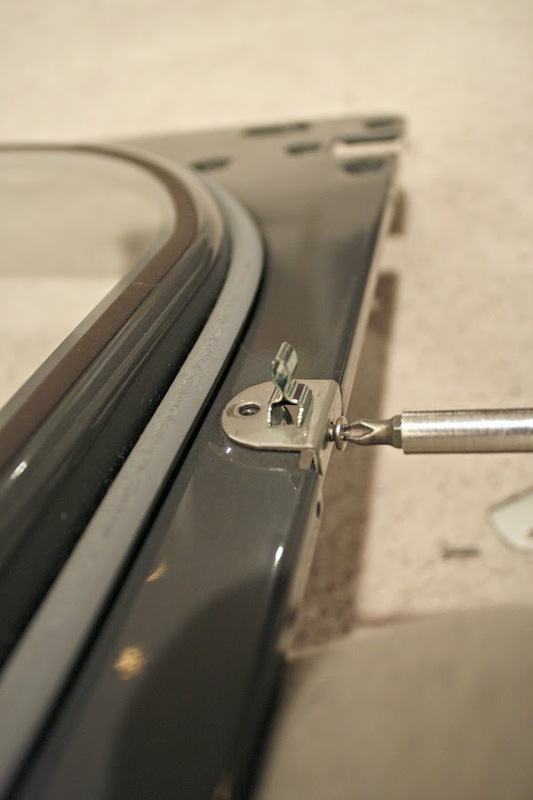 I lived in a different home when I bought this set, I had some problems with the washer getting off level then, but after I moved, we can't seem to get it level and it drives me crazy. It is also supposed to have a self balancing feature. It does not matter if you are washing a light load or heavy rugs, it will jump all over the place. UGH! I do not recommend the Samsung for this reason. Wish I had gotten the LG now. Good review. I have this set only my dryer does not have the steam. Love both the washer and dryer. I live in California (think drought) and this was the only top loading washer our water district was offering a water efficiency rebate on. Initially, I had my eye on a front loading washer but figured out they were all too deep for my small laundry room. I've had this set about 7 months and it washes and dries very efficiently. My Dad used to work for an appliance parts place, so he always told us to avoid LG and Samsung. He said their parts are way too expensive and harder to get. However, when we stick to his "tried and true" Whirlpool brand, we always have problems! Sure the parts are inexpensive, but I have to make repairs more often. LOL! I do LOVE how big my washer is. It's like yours, with no agitator. I had forgotten how awesome it was until we just went on vacation and I had to do laundry at the hotel. Hardly anything fit in it! I was so disappointed! I also have to use barbecue tongs...mine are just plastic but living the silicone idea. Plus I need them a little longer. Lol! I'm 5ft tall as well. I was using a stool but it almost slid out from under me. Eeeeekkkkk! Next on the list...I better step ladder. One that I can fold up and set right next to washer. I love the "ditty" my LG front loader plays when the load is complete. I call it the "happy laundry song". I've been trying to write lyrics to it, but haven't come up with anything worthy of it's cheerfulness. I have a top loader and in my laundry room a front loader would not work. The washer is right by the door coming in from the garage. I have almost got smacked by the door putting or taking laundry out, not to mention I am 5'2". I got rid of my chest freezer because it was too hard to reach the bottom. I would love to have an LG when mine dies. Hopefully not for a long time. Top loader for life gal, here! I have your exact set. I got mine about one year before you did--and commented on your post about it. Years later, my LG pair are still working their magic. 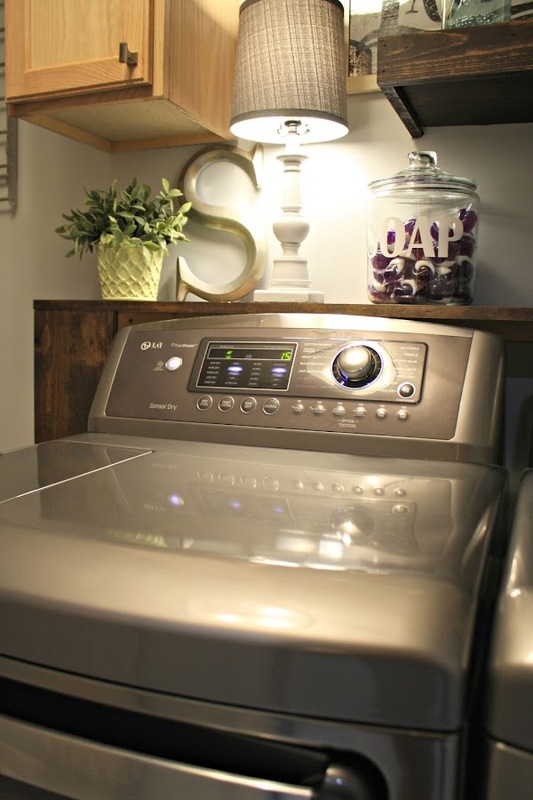 This washer has an excellent soak cycle (I use it all the time for my husband's workout clothes!) and does have an override that will allow you to fill the tub for items you feel MUST swish around in the maximum amount of water possible. I've never been so happy with a washer as I have my LG. The companion dryer has been nothing but a delight as well. I don't often use the steam capability, but it's nice to have it when I REALLY want to avoid ironing. We bought that same exact set in 2011 and have had zero problems with them. I still like them a lot. We have an LG front loader that is about 5 years old. The only complaint I have is that all of the lettering on and around the buttons is wearing off. My mom has an LG that is a few years older and has the same problem as well as another friend. 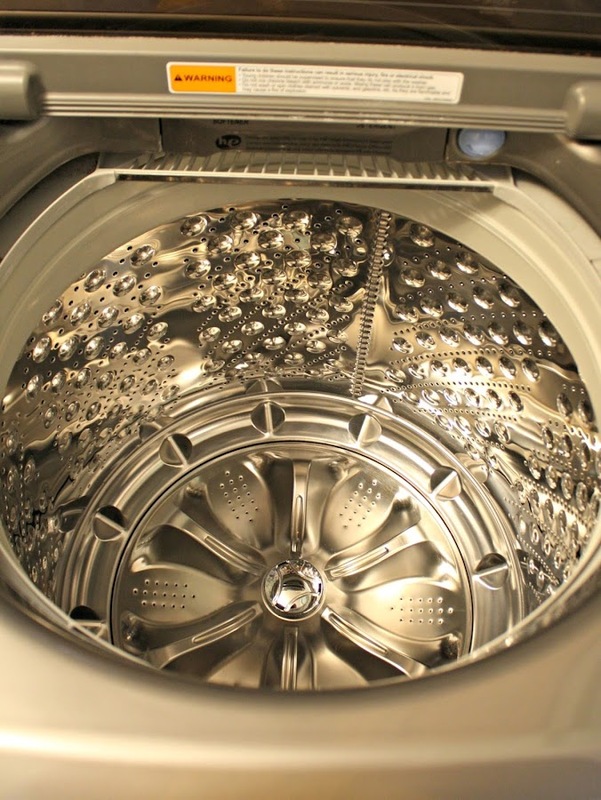 We only use soap/water to wipe the fronts of the washer or dryer so it is really frustrating. We have called LG but apparently they say it is not a known problem.